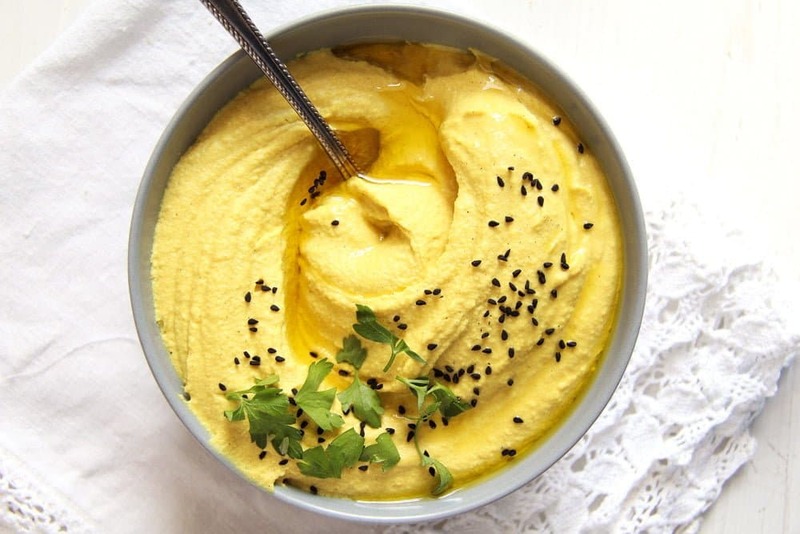 Hummus or Hoummus made with turmeric paste, tahini and pretty much garlic. I have quite a passion for hummus. Homemade hummus to be precise. I discovered hummus quite some years ago, while living in London, where you could buy it just about anywhere. I had never heard of it before, never seen in Germany and never really knew what it was. I bought it because I am always interested in trying new things and because some of my work colleagues used to have it in their lunch box. I was really ambivalent after trying it for the first time: do I like it or not? It was like nothing else I had tasted before… But then I did like it and even more so after starting making my own hummus. Nowadays, I can buy hummus here as well, actually that started only about one year or so ago, after so many refugees settled in our area, now many supermarkets started putting hummus on their shelves. But I still take the time to make my own hummus most of the times, it is easy to make, tastes better and it can be enriched in so many wonderful ways. I’ve been making this Best Hummus Ever for a long time now, either pure or adding some other ingredients from time to time. 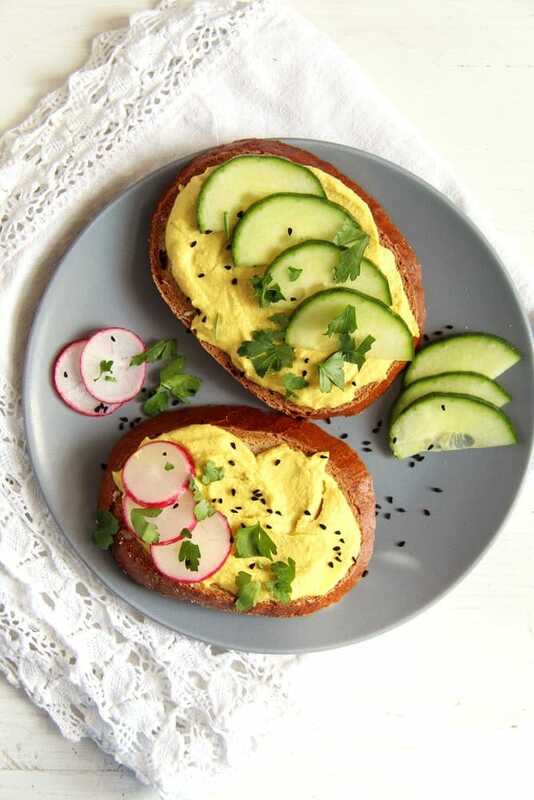 So, when searching for ways of using some of my Turmeric Paste for Golden Milk, adding it to hummus was probably the first thing that came to mind. I am so glad I did it! 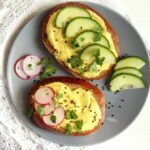 This Turmeric Hummus tastes absolutely amazing and it makes the already healthy hummus even healthier. I prefer to cook my own chickpeas for making hummus. I know that that is a lengthy process, you have to think about soaking the chickpeas the night before and despite the fact that most chickpea packets state that the chickpeas need about one hour cooking time, they always need more. And I do like using some of the chickpeas’ cooking water for the hummus, I am sure it enhances its flavor and creaminess. However, if you cannot be bothered with cooking chickpeas at all, do use canned chickpeas and some of their cooking water. I do it from time to time as well and I still love every spoon of that hummus. 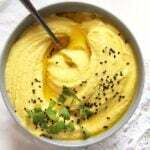 For more instructions on cooking chickpeas have a look at this post for The Best Hummus. Whenever I cook chickpeas I soak and boil an entire packet even if I need only ¼ of it. I freeze the remaining cooked chickpeas and used them either for making hummus again or for cooking other dishes like this Roasted Beetroot with Crisp Chickpeas on Greek Yogurt or this Vegan Zucchini Cashew Green Curry with Chickpeas. Or you could make this Vegan Apple and Chickpea Curry with Coconut Milk or this Broccoli Chickpea Soup with Turmeric and Sriracha Sauce. for making the hummus, it is a powerful kitchen machine, which I totally love. It is important to have a good kitchen machine when making hummus, it will make it creamier. And don’t forget to scrape the walls of the machine several times in between to make sure you will obtain a nice consistency. Add chickpeas’ cooking or can water to get the desired consistency, I start with about 100 ml/ ½ cup and add more accordingly. For more information on turmeric and its health benefits, have a look at this article: Health Benefits and Uses For Turmeric Paste. See instructions on cooking chickpeas here. Reserve some of the cooking water. If using canned chickpeas, drain and reserve some of the can water as well. 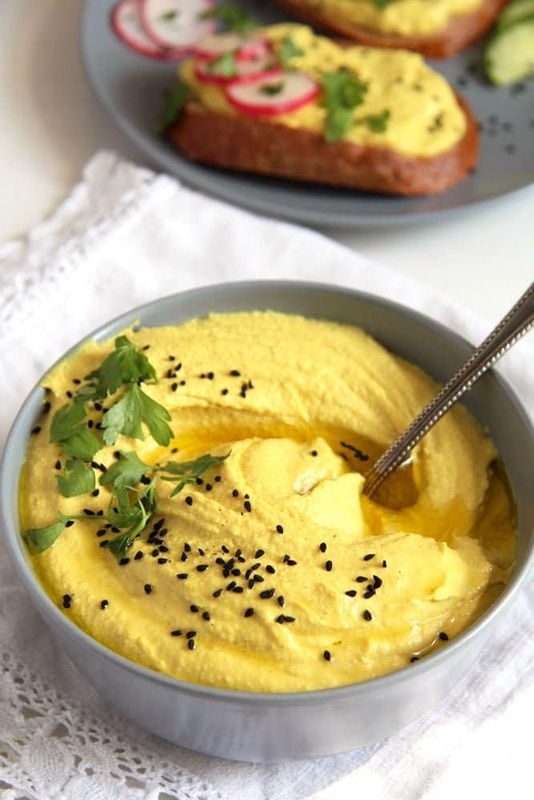 Place the chickpeas, about ½ cup of their cooking or can water, garlic cloves, tahini, olive oil, half of the lemon juice, turmeric paste for golden milk, salt and some pepper to the kitchen machine. Process well until creamy, scraping the walls of the machine a few times in between. Add more cooking or can water until you reach the desired consistency. Adjust the taste with more lemon juice, salt and pepper. Transfer to a bowl, sprinkle with some nigella seeds and finish with a drizzle of good olive oil. Serve on bread, crackers or as a dip for raw vegetables. I did something very similar today too, Adina. So yummy with turmeric. I love hummus too, but I’ve never had it for breakfast! I will have to give it a try in the morning. The color on this hummus is so beautiful! You will soon be able to write a 1000 turmeric recipe cookbook! 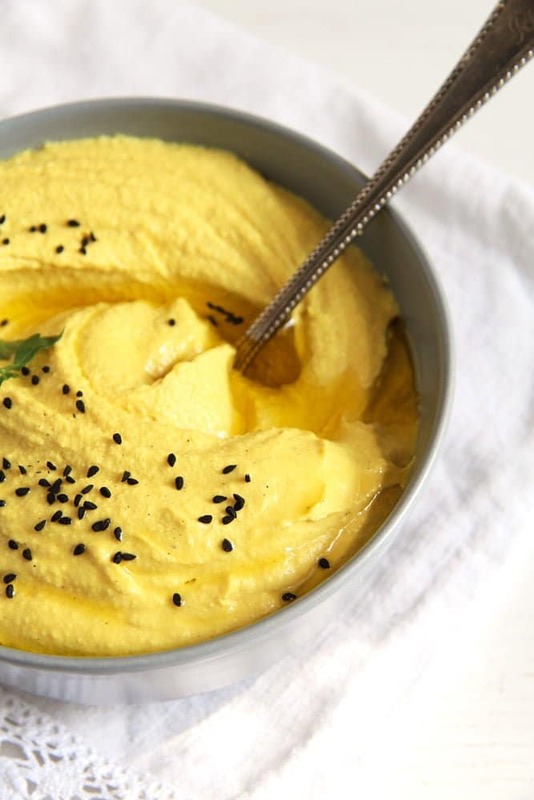 I am in a stage where I think everything tastes better with turmeric, but have never tried adding it to hummus. (I also make my own hummus, recently almost always with cooked not canned chickpeas and love it for breakfast with some chilli sprinkled on top!). The colour is lovely and I’m impatient to taste your recipe soon!